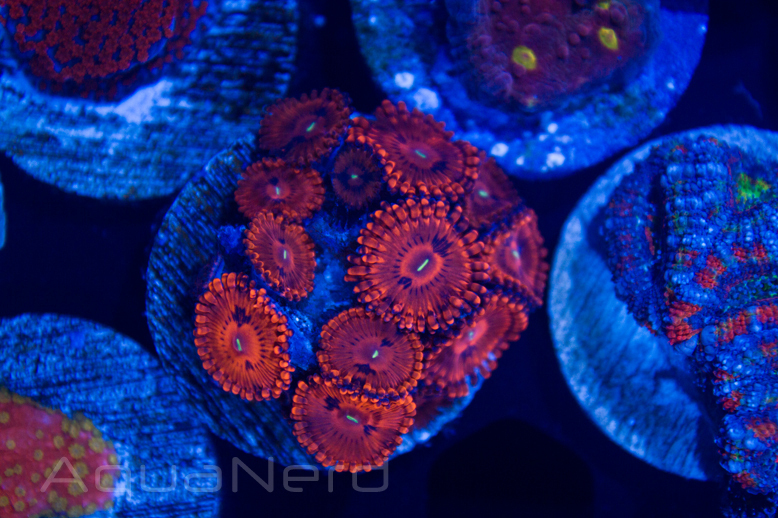 When it comes to Zoanthids and Palythoas, there is such a variety of polyps available that there is at least one favorite out there for ever hobbyist. And while most of the polyps out there are gorgeous in their own right, the one that holds a special place in our hearts is the KO’s Nightmare Paly. We’re pretty partial to red corals to begin with, but the KO Nightmare is really special. It sports a deep red hue, almost crimson in appearance, and it is accented with specks of black on its tentacles and oral disc. Its mouth can sport a green look, but we also encounter it with a white streak instead. Over the last few years, the KO’s Nightmare has sort of changed, in our opinions. We’ve seen them shift toward a more vibrant red with deeper blacks, but in all honest we think it’s just gotten better with age. Of course, the coloration all depends on lighting and water parameters, but it doesn’t change the fact that the corals look excitingly better than previous generations.